So with elimination diets put out there… Are you considering doing a GLUTEN-FREE trial? Have you got some alternative foods in mind? – or if you have to, GF weetbix or rice puffs – try to add some fruit, seeds or yoghurt to add in some goodness! Can you think of other ideas for this list?? Please add them to help others out! In the olden days, allergies used to be rare and no one knew about food intolerances. But these days, I’d be inclined to say the majority of children are intolerant to at least one food and most little bodies don’t handle food additives and chemicals from their environment. DARK CIRCLES UNDER THE EYES indicate a sensitivity to a food or chemical. From my study, I have heard many professionals state that blood tests are not the most reliable method of testing for FOOD INTOLERANCES. They use a simple elimination test (OR this with a blood test, testing for IgG antibodies, not to be confused with IgE antibodies associated with allergies). The definition of a food intolerance is : if you feel worse when you eat it and better when you don’t, then you have a sensitivity. For kids, you’ll be looking out for physical and behavioural symptoms rather than relying on them telling you how they feel. Fedup.com can you give an idea of the types of symptoms you might see. Some have recommended a 7 day elimination test whilst others have recommended 3 weeks, before reintroducing the food. I would personally say, the longer the elimination diet, the more the body will give you a clear answer when you reintroduce it. Can you fathom an elimination diet to work towards better health for your child? Trust your gut! What do you think would be impacting on your child the most? Food additives should be a definite first (ie all numbers, but see fedup.com.au for a list of the nasty nasty ones). Gluten and/or dairy are also good ones to consider removing. Some can rip the bandaid off and eliminate many food types at once. Others will need to go slow and steady. Do what works best for you, to avoid too much stress. It does not have to be too hard! Pick a food group to eliminate. Look through your pantry/fridge to identify ALL the foods that contain this food group. Brainstorm a list of alternatives. Let yourself sit with this idea and new list of foods, so you can get your head around the change. Be positive that what you are doing is worthwhile for your child! When you believe in it, your child will too. Eczema is one of the body’s last cries for help. It is desperately trying to expel toxins from the body, that it has not been able to do so through other means. It is related to chronic inflammation of the gut and liver and has much less to do with dry weather and ‘thin skin’ than most fact sheets let on. So what could be causing it? A food that the body does not digest well will certainly have the body in turmoil. A food sensitivity will tend to produce inflammation inside the body and may present as either an allergic reaction or simply nothing external, at first glance. The body may try to cope with this inflammation via eczema, particularly if the liver is functioning poorly. Chemicals are another cause of eczema. This may be from external contact such as soaps, chlorine and detergents and also sunscreen. It may also be from chemicals that the digestive system is exposed to, such as non-organic foods, food additives and even overuse of medications such as steroid creams and antibiotics. Yes, the very products doctors are prescribing to ‘bandaid’ the effects of eczema! Besides food and chemicals, stress can be another cause. Elevated cortisol in the body can literally produce holes in the intestinal lining, allowing undigested food, yeast and other toxins through, again producing inflammation in the body. What can I do about eczema? If you aim to get to the root of the problem, try not to turn immediately to steroid creams and ‘dry skin’ products like QV bath oil or Alpha Keri Wash. These ‘dry skin’ products are still made by pharmaceutical companies, with less-than-natural ingredients such as paraffin, petroleum jelly and parabens (known carcinogens), sodium lauryl sulphate (SLS – a dangerous chemical), triclosan (a pesticide) and a host of other chemicals. The more detoxifying your child’s body has to do, the more their liver is overloaded and the more likely their body will be forced to excrete these wastes through the skin, as eczema. To be proactive, you will need to consider either first removing potential culprit foods, at least for an elimination test or turning to natural products, to reduce the body’s toxic load from chemicals. In the meantime, consuming Omega 3 and 6 oils, in the form of say fish/krill oil, flaxseed/linseed oil, avocado, cold-pressed olive oil and organic nuts such as walnuts are extremely important for those suffering from eczema. Probiotics, to support gut health, have also shown great improvement. What are the best natural skin products? Coconut oil is the best product you can use! It can be used as a soap, a moisturiser, an antifungal/viral/microbial first aid cream and a bath oil. It is even an ideal toothpaste (Natural toothpaste recipe) as it kills off the germs and remineralises teeth at the same time. Natural sunscreens do exist. You just need to visit your local health food store to find them. Interestingly, studies have shown how sunlight can improve eczema. How do I determine the culprit food? This is a tricky one as eczema may not show up immediately after consuming an inflaming food. Go with your gut. What foods do you think are the worst offenders for your child? Start by doing a 3 week elimination test of this food group and then watching closely as you introduce it back in. Once the body has had a break from this irritating food, it will gain strength and give a much clearer signal of distress when you add it back in. For those wanting less guesswork, you can seek out an IgG blood test to determine foods your child may be intolerant to, an IgE skin prick test to look at allergies, or using kinesiology to test how the body copes with the main allergens, with simple, pain-free muscle testing. Is it easier to just ‘bandaid’ the cause? Initially, it definitely seems easier to ignore eczema by using creams and dry skin products. It is easy to blame the weather or put it down to ‘no known cause’. However, eczema visible to our eyes means chronic inflammation on the inside of the body. Research is showing chronic inflammation is the start of all diseases and even cancer, later in life. It is linked to auto-immune disorders such as asthma, ADHD, autism, Alzheimer’s, neurological diseases, arthritis and also linked to obesity, diabetes and heart disease. Eczema will come back to bite harder later in life. A few simple steps such as adding in Omega 3 oils, probiotics and replacing coconut oil with many chemicals, will significantly reduce your child’s chances of living with eczema. Looking into removing culprit foods will improve their chances even more. And chances are, you’ll improve your whole family’s health at the same time. 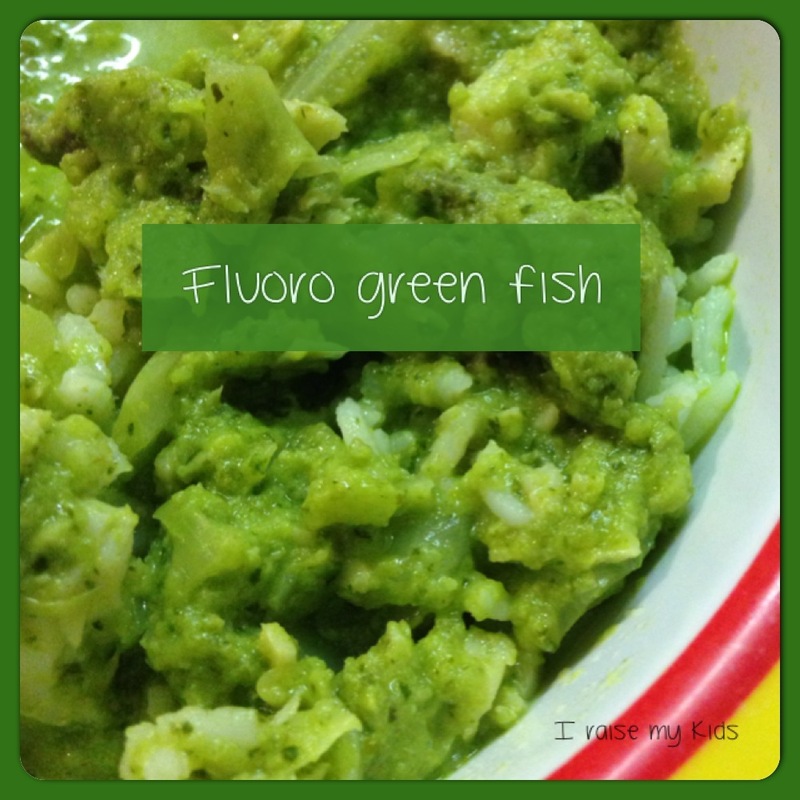 How to eat fluoro green! Well I meant to make a nice coconut, Asian-style fish dish for dinner tonight. But instead, I opened up our Thermomix to fluoro green…! I was extra-keen with the coriander (a great herb to strip heavy metals from our body) but to my surprise the boys LOVED the green sauce and ate the meal! Hooray for their body’s reaping the benefits. This dish made enough for three of us (husband away). I made this in our Thermomix, but please give it a go if you don’t have one. It’s a forgiving recipe that can be made roughly to these measurements. 1. Add garlic, ginger, onion, coriander and zucchinis to the Thermomix bowl. Grate 10 secs – SP 8 until smooth. 2. Add oil and cook 100deg – 2 mins – SP 1. 3. Add turmeric powder, salt, pepper, cabbage and mushrooms. Cook 100 deg – 7 mins – SP 1. 4. Add fish and coconut milk. Cook 100 deg – 5 mins – SP 1. Serve with rice, quinoa or cauliflower rice, carrot ‘noodles’ or just as is. So what do you think, can you fathom testing your kids on the greenery? 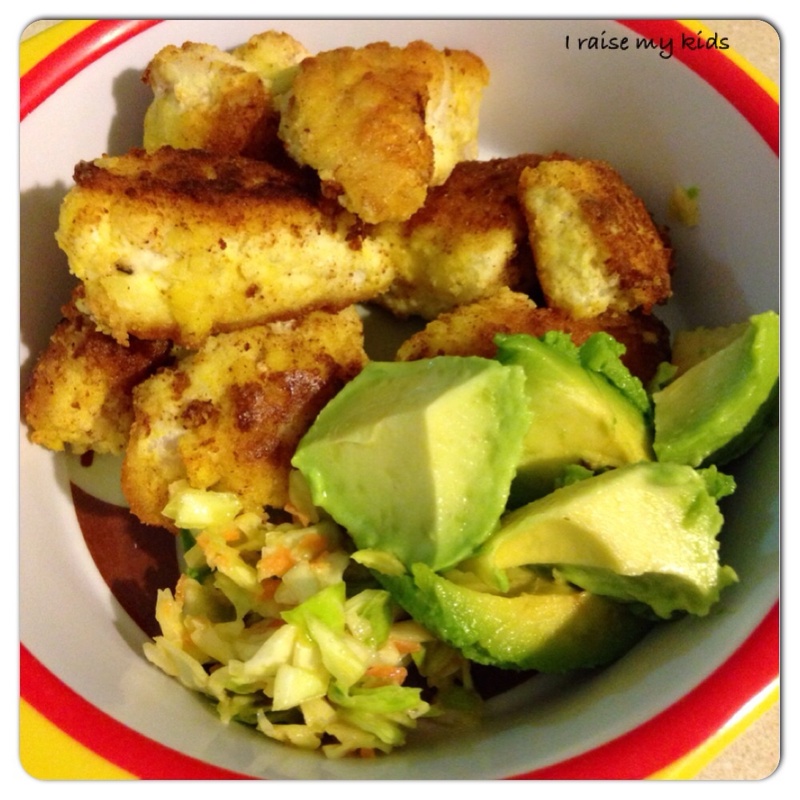 An easy gluten-, dairy-, soy-, corn-, yeast-, grain-, additive-free, ‘Paleo’ dinner that ANYONE would love! And introducing Master2 to coleslaw…. This is how it went. Adults can join in too! (Turmeric has so many superpowers including reducing inflammation, not to mention it gives the nuggets a great golden colour). Our Thermomix is a saving grace at making homemade mayonnaise and coleslaw. This way we avoid additives, sugar, gluten and other not-so-desirable ingredients in store-bought mayonnaise. Of course, if you don’t have a Thermomix and can’t fathom making mayonnaise, compare ingredient labels to find one with few ingredients. As you can see, I’ve provided plenty of fish, some avocado for good fats that will also fill Master2 up and THE SAMPLER of coleslaw. As he’s never seen it before (that he can remember), I reduced expectations to even eat ANY and put out enough just for experimentation. He wasn’t keen when it stuck to his avocado, although that was my plan. However, we distracted him to focus on his fish. By the time he was stabbing his avocado (with help from Dad), he unwittingly ate some. No chance of a full scoop, but I’ll take some in the mouth a win!!! We had ours with a pile of cherry tomatoes too. That’s a challenge for both boys on another night!